If you’ve been putting off replacement windows because it just doesn’t seem like the right time, stop putting it off. Fall is a great time for new windows in your home. And although there is really no bad time, the reason fall is such a great time is that there are fewer bugs, the temperature isn’t too high or too low, and you’ll start saving on your energy consumption as soon as you turn on the heat. If you’re wondering if new windows really are worth the money, here are a few things to know about replacement windows. We’re not going to be one of those window companies that tries to claim your windows will pay for themselves in just a few years, however, over time, they most certainly will. 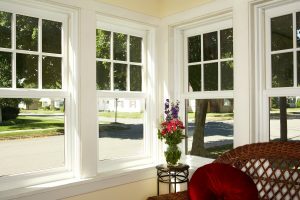 Here are three ways your windows provide you with a return on investment. Lower utility bills – depending on the age of your windows, you may save as much as 40% on your heating and cooling costs. Less fading to your carpets and furnishings – because new windows have Low-E glass that includes UV protection, your carpets and furniture will look better longer. Resale value – although no home improvement returns the entire investment, nationally, replacement windows return about 70% when selling your home according to Remodleing.com’s 2018 Cost vs. Value report. No matter how much or how little you save, there’s no arguing your home will be more comfortable. If your old windows were painted shut or simply in such bad shape they wouldn’t open properly, you’ll enjoy the cool fall and warm spring air in your home. Over the winter, you’ll love not feeling the drafts as you walk by your new windows. And if you count peace & quiet as part of your comfort calculation, you’ll be amazed at the reduction in outside noises your new windows will provide. Although curb appeal is often cited as a reason to look at replacement windows, inside your home will look better too. Many new low-profile windows give you more natural light in the same size opening. Plus if you had old wood windows with multiple layers of paint, your replacement windows will be nicer to look at. If you’ve been looking for a reason for replacement windows, we hope today’s blog has given you the nudge you needed to call us for your free estimate. Remember, Peak Roofing Contractors is more than a roofing company, we’re also your replacement window company. Call 703-753-4585 or fill out our contact form.